When a large UPS connected to the Campus' Voicemail system stopped switching over during power failures, it was time to replace it. Now that we have generator power, a UPS with extended runtime isn't that critical, it just needs to be able to keep the power up until the generator kicks in. When I took the old UPS apart for a looksee, I was fairly surprised to find an automotive-sized 12V sealed battery, and overjoyed to discover that although the UPS wouldn't switch over, it had been keeping the 122A battery charged. 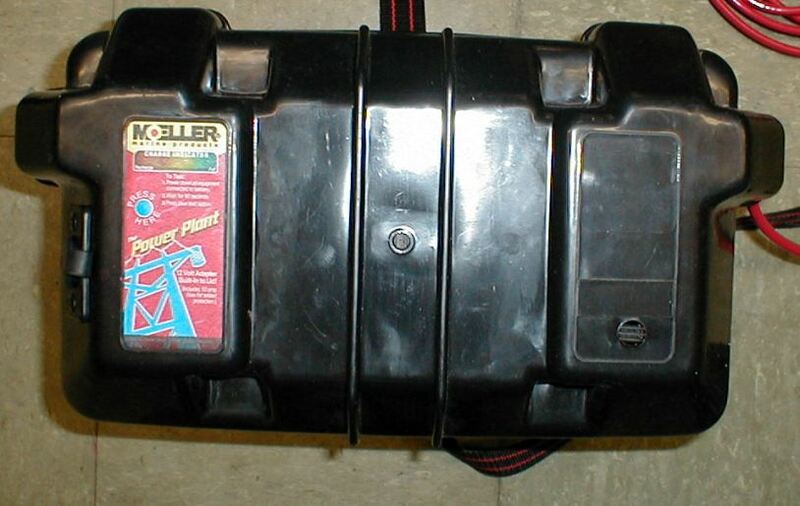 I looked at "standard" marine battery boxes at WalMart and Rural King, but found this Moeller "Power Plant" Battery Box online at Amazon for $30 and free shipping. Note it includes a "press-to-test" indicator and a cigar lighter outlet already built in, and it's only a few dollars more than a standard black plastic box..
Next was to get a 75A Powerpole cable from Powerwerx. I used the same thing in my mobile installation along with their PS-75/45-4 - Red-Dee-2 Connect splitter that turns one 75A into four 45A. Not shown is the 60A fuseholder installed to protect the circuit. 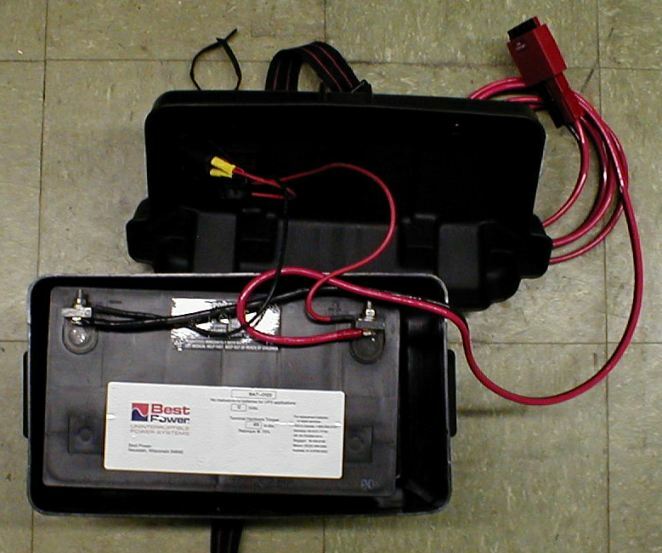 And then I got to thinking, I'm not really going to be toting this battery around much. It would serve a better purpose as a backup battery for my radios to cover the 15-20 seconds between the time the power fails and the generator kicks in. At that point, I lose radio power for about 15 seconds. Enter the Samlex BBM-12100. This sits between a power supply (in my case an Astron RS-50M) and the battery. Then there is an output from the BBM to the rigs. The BBM provides a maintenance charge to the battery as long as the power supply is functioning, but if power fails, instantly switches over to the battery. It's capable of handling 100A. Samlex also offers a smaller 25A version. 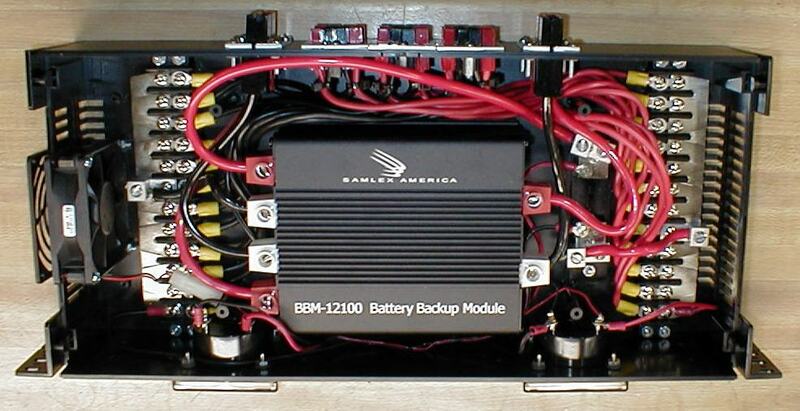 West Mountain Radio has a similar product, but it costs more and handles less current than the 100A Samlex. 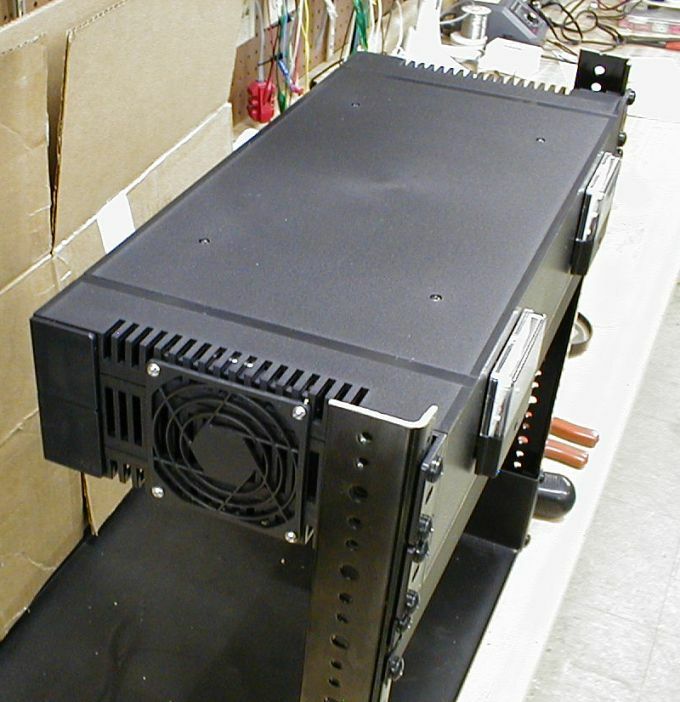 I looked for rack mount cases and decided on Bud's PRM-14462 from Mouser. In retrospect, getting everything in there was pretty tight fit, and the modular plastic case probably shouldn't be holding this much weight. Connections for the battery and power supply are 75A Powerpoles mounted to the case using Anderson PP75 clamp sets. Twelve 30A outputs are mounted using the smaller Anderson PP15/45. All Anderson products were purchased from Powerwerx. Output power is distributed using 12-terminal Cinch 142 series barrier blocks with 30A capacity, and Cinch 1423-2 jumpers purchased from Mouser. The fan and guard, plus the voltmeter, ammeter and shunt came from Marlin P. Jones. At the time of this writing MPJA also sells the Bud case or its clone for less than Mouser. The large lugs on the barrier blocks and ammeter shunt were purchased at Lowes. All wired up and mounted in the rack. The 1U filler panel helps to keep the plastic case from sagging on the corners... alas there are only 4 screws holding the case together using the internal stand-offs. Like I said, I probbly should have paid more and bought a metal case. You're right, things got a little crooked, but I figured I'd rather have crooked connectors than take more meat out than I had to. The fan is solid mounted using two #6-32 screws at the bottom, and then threaded spacers were attached to the fan for the top screws to thread into. This allows the case's top to be removed if necessary.